Light commercial vehicles intended for the transport of perishable goods and goods requiring certain temperature conditions, can be equipped with independent temperature recorders. 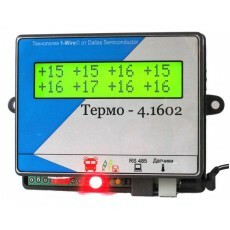 8 digital temperature sensors are connected to the device. Data is transferred to a personal computer through a standard USB interface. A large LCD display makes it convenient to observe sensor readings from the driver's seat. Non-volatile memory for 50 000 records, ensures the safety of the measurement data, even during prolonged power outages. The data saved in the device can be handled by user-friendly program and systematized in the form of tables and graphical diagrams. The number of digital temperature sensors up 8 pcs. Interval of recording parametric sensor readings 1 мин. Power supply =12 - 24V. Power consumption not more than 5 Watt. All saved data can be downloaded to a personal computer through a USB port in a specially designed software which can run on Windows 98, 2000, XP, or Vista / 7. Using this software the user can specify the required logging parameters, set the measurement cycle, the upper and lower alarm levels. Reading the saved data and to generate reports either by timestamps or temperature deviations.